When I was thinking about becoming a mum, I remember having an idea in my head of the things I'd do, and what I'd be like...a bit like little girls who plan their weddings and know exactly what dress they're going to wear. I would be a cool mum, the one who all the other kids liked, the one whose house would be pretty much open for snacks and playtime anytime, the one who would have plenty of other mums round to chat over coffee and the one whose garden would be full of children running around playing in the summer, whilst I provided tray after tray of homemade cakes and biscuits, and jug after jug of chilled squash. I'd also have a small but very close network of other mums (who I'd met at playgroup) who would babysit for each other, pick the kids up from school, and because like surrogate aunties to my children - just like my mum and her friends. In fact now, 30 years on, my mum is still friends with one of the playgroup mums, and she is affectionately referred to as mum no.2. In reality, I missed out on meeting other mums early on at playgroups, the other mums at nursery were rather snooty and wouldn't talk to anyone else, and now Mini's at school and doesn't seem particularly friendly with anyone. Don't get me wrong, he has friends, and there are a couple of them who I'd happily have round for playtime, dinner, and in the summer - a play in the garden. But he hasn't got that big circle of friends that I hoped my child would, or even a best friend, he often isn't in the right frame of mind to have friends round anyway, and I'm too embarrassed by my freezing cold house to invite the few mums that I am friends with round for coffee. There are a couple of other mums who I know I could call if I was really stuck for picking Mini up, and one has been a star recently, but in all honesty, Mini couldn't cope with it. This week he hasn't even been able to cope with the thought of the NC picking him up, let alone anyone else. Right now, we're at a crucial point with therapy, where Mini is a blank canvas and we can start working on emotions and making him feel secure. I don't want to do anything to jeopardise that. This is yet another one of those ways in which adopting is different. My son's needs mean I can't be the type of mum I thought I would. I'm sure I might come across as over protective to the other mums, making excuses even, but really, I'm putting my own needs, wants and hopes to one side so I can focus on Mini and his needs. That's what being a mum is about isn't it? I wish we'd spent longer on this during our homestudy. I feel we were unprepared for exactly how much our expectations would change. In fact, it's only now, 5 years in that I'm realising just how much they've had to change. I'm not sure if this is yet another thing I have to grieve for - or if just recognising that things aren't as I'd envisaged is enough. I guess I've got another few years of motherhood ahead, and things could change? Back in December I was approached by Charlie Plunkett to take part in her project 100 Little Words, after a nomination from the lovely Sarah at The Puffin Diaries. The project sounds simple...write 100 words on any aspect of parenthood, which would be included in Charlie's newest book '100 Little Words on Parenthood'. The first challenge was finding a particular aspect of parenting to write about, the second, was making it exactly 100 words long, which is much much harder than it sounds. I wrote a poem about my personal journey from infertility to adoption to pregnancy and birth, and I'm thrilled that Charlie has included it in her book. I can't wait to see the real thing in print! So far our sessions with Dave-the-therapist have gone well. We've had 3 with Mini there, and at times he's engaged, sometimes not so much, but he's listening the whole time and if Dave gets something wrong Mini will suddenly pipe up and let us know. He's often quite hyper in the sessions and whilst we sit on the sofa, with Dave in a chair nearby, Mini gets increasingly fidgety and gradually starts moving around. He's clearly becoming more familiar with the surroundings and is feeling safe enough to explore - this is good as of course we want him to feel safe enough in sessions to explore things that will be difficult. However, the manner in which Mini fidgets and moves is different to the way he is at home. It's like he's agitated, but not in a cross way. He sort of darts around, paying little attention to the things he's looking at (he can't pay too much attention to them because that would mean he couldn't listen to us talking so well), and he just seems...wrong. There's no anger or crossness, indeed he doesn't appear to be showing any emotion at all. It doesn't feel like he's about to tip into flight and start running, nor does it feel like he's going to fight. I've asked Dave if this behaviour is normal and he feels that because we're starting to talk about things that are uncomfortable, which bring new emotions, that it's going to make Mini behave in new ways. He's trying to find different ways of handling these different feelings, which of course makes sense. After each of the first two sessions Mini was quite open with us, he was affectionate and started to talk about his feelings. He would do the exercises Dave set us the first time (5 hugs before school with mummy, 5 in the evening with Daddy), the second time we had some visualisation and control exercises which he started to struggle with and push against. But this last time has seen new behaviour develop that is more than a little challenging. He rejects me completely - no hugs, no kisses, no touch, no words. Unless they're on his terms and when he wants them - which is rarely. Funnily though the minute Dollop wants a cuddle, kiss or conversation, he's suddenly there pushing her away. He doesn't want me, but no-one else can have me either. Conversations are rare - grunting, growling and shouting have been Mini's preferred methods of communication. He has this 'special' way of rattling the phlegm in the back of his throat to make a growling sound and that becomes the response to most questions and requests, either that or a definite 'NO!'. Like a toddler, Mini is using NO as pretty much his only verbal communication. And I have no way of handling that. You can't merrily cajole a strong 6 year old into brushing his teeth, you can't force him either. I can't jolly him along to eat a meal or put his shoes on. If I 'encourage', 'help' or 'force' him, I'm met with a slap, scratch, punch or kick. The bear hug 'restraints' that have worked before (holding and reassuring) don't at the moment...he wins these battles because after 20minutes of holding a writhing, thrashing, angry heap I have to let go. In the past when Mini and the NC have argued, Mini will run to me, let me hold him, let me reassure him. But not now, even when he's upset by the NC, he will run away from me and stand alone - unable to regulate his feelings, or let anyone help either. Dollop is frightened and Mini seems to be taking perverse pleasure in frightening her even more. He snatches her toys, hits her when he thinks we're not looking, bickers with her, pushes her away and gets right up to her face - foreheads touching - and shouts/growls at her. Our next session with Dave is next week and was supposed to be just me and the NC, and we were supposed to be discussing a move from this talking family therapy (with small elements of Theraplay) to full on Theraplay, then Mini's next session would be a fortnight after that. However, after a week and a half of this, we can't wait another 2 weeks before Mini's next session, so it'll be a crisis call to Post Adoption Support on Monday to request moving straight onto Theraplay without the feedback/discussion session for me and the NC. I always knew things would get worse before they got better. And whilst I understand that this is probably progress, and Dave-the-therapist is right that this is a reaction to new thoughts and feelings...it's hard. All I feel I can do right now is acknowledge Mini's feelings, and thank him for letting me know about it. I have another child to think about and protect, indeed I need to protect Mini and keep him safe too, but he's making that bloody hard to do right now. It's gonna be a long weekend. Welcome to the brand new Weekly Adoption Shout-Out. 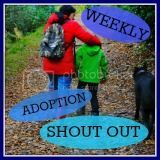 This is a new link-up hosted by Sarah at The Puffin Diaries and myself Vicki, here at The Boy's Behaviour, and aims to bring together adoption bloggers to share posts and discover new blogs. You don't have to be an adoption blogger to take part, but we do ask that your post relates to adoption in some way. This link-up will be open every friday, and there is no limit to how many times you can join-in, we hope to see you every week! So without further ado, get stuck in and add your link below. As both The Puffin Diaries and The Boy's Behaviour are hosting, this linky will appear in both places but you only need to add it once. If you comment on any of the other blogs, please let them know who you are, and how you found them. This week is one that I find tough. It happens every year, but it never gets any easier. It's a happy week, one in which the anniversary of us meeting Mini for the very very first time occurs. 5 years ago this week we started 'introductions' with Mini. I still remember walking into his foster carer's house, past the kitchen where he was eating his lunch, not wanting to sneak a peek until I could see him properly and take in every little gorgeous almost 13month old bit of him. Then a few minutes after, his social worker came through and unceremoniously plopped him on my lap. She almost had this kind of 'finality' about her, as if, now he was on my lap, that it was all over, he was ours and she'd done her bit. We had a few hours playing and just absorbing him with his foster carer observing, and popping in and out. As an experienced carer she knew when to give us space, and when Mini needed her there. We stayed longer than we were supposed to, and were eager to return the next day. It's a week of being grateful, as I recall the difficulties that the NC had in that week of introductions. I remember the times where he didn't want to go through with bringing Mini home and I remember literally begging him, sobbing on the floor at his feet to let us carry on, to let us bring him home. Luckily he sought help from our GP, and confided in our social worker who allowed us to go through with it all, but kept an extra close eye on us, and delayed us applying to court to formally adopt Mini. I was selfish, but also scared and desperate, and I will be forever grateful that the NC was strong enough to go through with it. It's a week of remembering, as the day we met Mini is also the anniversary of my dear dad's death. I refer to it as his angel day - I'm not sure what I believe around angels, but I do like to think he's up there looking down on us. Dad has been gone for 9 years now, and I can still remember many of the details of what happened 'that night'. My dad took an overdose, but it was about 24hours before he actually died, in hospital - he'd taken American painkillers which contain different drugs and the hospital had trouble finding an antidote quickly. In the end, the drugs ate away, caused massive internal bleeding and his heart gave up. Afterwards, we discovered that he had heart disease too, which would have made it harder for his body to fight, although he didn't know that. He was just 47. My dad never knew that we were going to adopt. He never knew he would have become a grandad. He doesn't know (or perhaps he does?) that I tell my children about him, that he is still their grandad even though he's not here. He would love them so much. If I close my eyes I can see him playing tricks with Mini - pulling a ball out from behind his ear like he used to with me. I can see him having a kick around in the garden with Mini. I can see him tickling Dollop and laughing along with her as she giggles. And I can see him teaching them both all manner of funny faces with all of them in hysterics as they do it! I miss all those things even though they never happened. I miss seeing the relationship between my babies and their grandad grow, I miss seeing my dad grow - he's stuck in my head at he age he died, perhaps that's a good thing. Mini and Dollop have other grandads with whom they have wonderful relationships, but I am sad that they couldn't have that with my dad too. I won't share the reason my dad committed suicide, it's personal to him, and painful for me but I've always wondered why I wasn't enough of a reason for my dad to live. I know he was depressed and struggling with his situation, but I still can't quite get my head around the fact that my brother and I weren't enough for him. So if Mini ever wonders why he wasn't enough of a reason for his birth mother to try harder, to be better, to be good enough to parent him, I can empathise, because I truly understand how it feels to not be enough. Well today is the 1 year blogoversary of The Boy's Behaviour. I can hardly believe it's been a year since I stepped into the blogosphere (without a clue of what I was doing!) and started writing it all down. In the last year we've had ups and downs, been shaken around a little bit, and we're still hanging on. Some days it feels like it's just the thinnest string of cotton that's holding us on, but it's as strong as silk and we won't be letting go. Now Mini is 6, and he's still displaying many of these behaviours, and new ones too. But, he doesn't have to make noise all the time anymore, the screaming is much improved, he has stopped counting everything, and sometimes he manages to successfully make a choice, and on some of the occasions when he can't he lets me make the choice for him without having a tantrum. Some of Mini's behaviour is utterly vile and dangerous, it still drives me mad, and at times I have no idea how to handle what's going on. But, we have a better understanding of where it's coming from, and why. This behaviour is not naughtiness, it's an expression of the mess and anxiety that's in his head. We've learnt that sometimes it doesn't matter what we do, and how we handle him (although obviously some approaches are definite no-no's) because it's inside Mini's head where the difficulties begin. Mini is now having professional help to get inside his head and help him understand what's in there, and we're getting help to support him in it. It's scary for him (it's not the easiest ride for us either), but help is what he needs. Healing has begun. After years of 'professionals' telling us that he was so young when he moved into foster care, and then to us that he shouldn't remember anything, shouldn't have been affected by his past, we've finally remembered our preparation, our training and our research, and we're strong enough to say 'hold on, actually....' and fight Mini's corner. And it helps that we're surrounding ourselves with different professionals - who know what they're talking about, who can get help, who can support us all. As a society I think we're pretty poor at shouting about our achievements, even the little ones. But I do sometimes celebrate our achievements here, see our recent great day out at Colchester Zoo and the time that Mini told me how he felt. However I know that the balance of positive vs negative isn't equal. I don't apologise for that, but I'm pretty sure that if I can try to be more positive about things, then Mini's attitude might change a little bit, and the things we're trying will have a better chance of working too. Plus I might feel a bit happier rather than being suspended in this place of anxiety, which feels not too far away from that rotten (and well-trodden) road to depression...I'm trying to avoid that road if I possibly can, it took a long time to get back from last time. So... I'm not making a resolution, as I said it's too late for that, plus I don't want to set myself up to fail. There are many different ways of trying to be more positive, some of them gimmicky, some of them lovely and some of them are both, but I want one that the whole family can take part in and take some responsibility for. We have lots of things to be grateful for - some of them small; the whole 8 hours of sleep I got last night and Dollop sitting still while I plaited her hair, some of them big; overall good health and a roof over our heads, and some in the middle; the brilliant time we had on Mini's birthday, our ever improving bedtimes and this morning when Mini wanted something unobtainable and I dealt with his demands therapeutically. I've chosen something slightly gimmicky, but there is no pressure to choose something every day, and we'll be able to easily see the good times mounting up - a Positivity Pot, which is basically a glass jar. Yes, you read that right. A jar. The idea is that we can scribble our good times down on pieces of crafted gorgeousness (that'd be me) or scraps of paper (the rest of the family) and pop them in the jar, we might add photos of great moments too. At the end of the year - or sooner if we need to - we can have a look through all the good times. The kids can help fill it up with the things they like - such as Mini had a great packed lunch, or Dollop was pleased to see Baby Whizz. How do you keep positive? Any good ways of recording the good times or do you rely on your memories? It's Mini's birthday today. Woo hoo! The boy has turned 6! To celebrate we took him to our nearest zoo - Colchester Zoo, after receiving a free family ticket courtesy of the Family Days Out voucher initiative from MoneySupermarket.com. Yes, it's a bit sneaky using it for a cheap free birthday treat, but Mini didn't know and as money is tight, it meant we were able to spend more on gifts, and buy lunch out instead of taking a picnic. So, not a great day weather-wise but we headed over anyway, and met up with Auntie H and Baby Whizz (for her first ever zoo trip!) in the (free) car park. I've lived in various places across East Anglia for almost all of my life, but Colchester Zoo has always been the zoo we've gone back to. Mini's zoo trips have always been there too, but we've not been since before Dollop was born (so this was her first ever trip too!). The reasons we go back? It's always changing, improving and developing. New enclosures are being built all the time, and in fact we saw them working on a new area for the Sun Bears today. Well laid out, buggy friendly and well signposted. And, it's always clean and tidy - inside and outside of the enclosures. Red pandas, chimpanzees, gibbons, orangutans, elephants, zebras, ostriches, giraffes, tigers, lions, rhinos, meerkats, mangabeys, sun bears, cockroaches, pirhanas, stick insects, sealions, African land snails, tortoises, komodo dragons, rhinoceros hornbills, flamingos, iguanas, tropical fish, anteaters, baboons, snakes, and Mini's favourite - the penguins. The list of what we didn't see is just as long, and I was particularly disappointed that we missed my own favourite - the lemurs, but it just means we'll have to go back (such a hardship!). Auntie H and I are already looking forward to it. This is the moment Isha sucked up the cabbage Mini was holding. That's the NC's hand on the right waiting to feed her too. After seeing as much of the zoo as we could, we headed back toward the exit to see the final requested animal by Mini - the bears...Sun Bears in this case. Really beautiful creatures. As we turned away, the NC and I remembered that the discovery centre was just around the corner, and as Mini had earlier mentioned holding a snake, we thought we'd take a look. Sadly, as we entered, it was clear that there were no animals out for holding. So we had a look at the bugs and beasties, including giant African land snails, and a lovely looking python. Upon seeing a friendly looking keeper, I encouraged Mini to ask if there was any chance of holding a snake, and we were so impressed that she took the time to check the snakes (they can't be handled if shedding) to find one who was ready to hold! So Mini got his wish, he was able to stroke (downwards toward the tail only) a Royal Python! Dollop wasn't quite brave enough, but even Auntie H and I had a quick go, once we'd been reassured by the keeper that it would just feel like a handbag. Which it did. Oh, and Colchester Zoo is on twitter - @colchesterzoo AND they have an app which the NC was most thrilled to download! I'd also like to add that the zoo celebrates it's 50th birthday this year, so this summer there will be some extra special happenings...we can't wait to go back! Orangutan - we think this one is Rajang, who was born in 1968. It was hard to tell though as the other Orangutan was playing with a blanket and we couldn't see his head! Today has been one of those days, but then it's followed one of those nights too! Last night the NC rushed Mini over to A&E after I witnessed Mini having a seizure. It wasn't as violent (in that he didn't convulse as strongly) as before, but I immediately asked the NC to take Mini's temperature. I must have looked worried because he did it straight away no questions asked. After the thermometer showed a completely normal reading, I explained what I'd seen to the NC. He'd seen something similar just 5 minutes before when Mini was sitting at the table, but wasn't sure what it was, or indeed if it was anything. So having both witnessed similar incidents, independently and at different times, we decided that Mini should be seen (as per the advice of the paediatric neurologist he's been seeing). Coincidentally, earlier yesterday Mini had an appointment with the paediatric neurologist, but they told us to cancel if Mini didn't have anymore seizures...so we cancelled, then literally hours later, he has two close together! We stayed calm, explained what was happening, and Mini and daddy went off to accident and emergency. Thankfully an overnight stay wasn't required, and they returned home last night. Mini by all accounts, was brave, polite, friendly and well-behaved whilst out. Don't worry - Mini is fine. He is unaware of the seizures and has no recollection afterwards. He wasn't ill or showing any signs of illness at any point. He was convulsing. This is alarming, and we're still not used to it (I don't think you ever get used to it), but we're thankful that Mini isn't aware. The hospital were happy to discharge him last night, instead suggesting we remake the cancelled neurology appointment, which we've done today (but it's not til April!). Of course this meant a late night, and therefore a grumpy child this morning. Coupled with the excitement of a friend's birthday party tomorrow and his own birthday in a few days time, all in all it's been quite a gruesome day, argumentative, indecisive and shouty. But, on the upside, bedtimes have been getting easier. My mother in law gave me a pot of Badger Night Night Balm to try. My sister in law had tried it on Baby Whizz but it was too strong for her and made her too sleepy, but she thought of Mini. I can't say for definite that it's the balm, or whether it's just that Christmas is over, but we haven't had the long drawn out bedtimes that we were, and Mini's even settled twice in his own bed rather than ours. Phew!